This is the softcover version of the catalog for our July 2018 "A Brief History of the Walt Disney Studios" auction. This gorgeous collectible reference catalog measures 11" x 8.5" and features lovely full-color imagery for almost 600 items available in the auction, detailed across over 180 pages. THIS CATALOG IS IN STOCK AND SHIPPING IMMEDIATELY. Van Eaton Galleries is proud to present “A Brief History of the Walt Disney Studios”, an Exhibition and Auction. 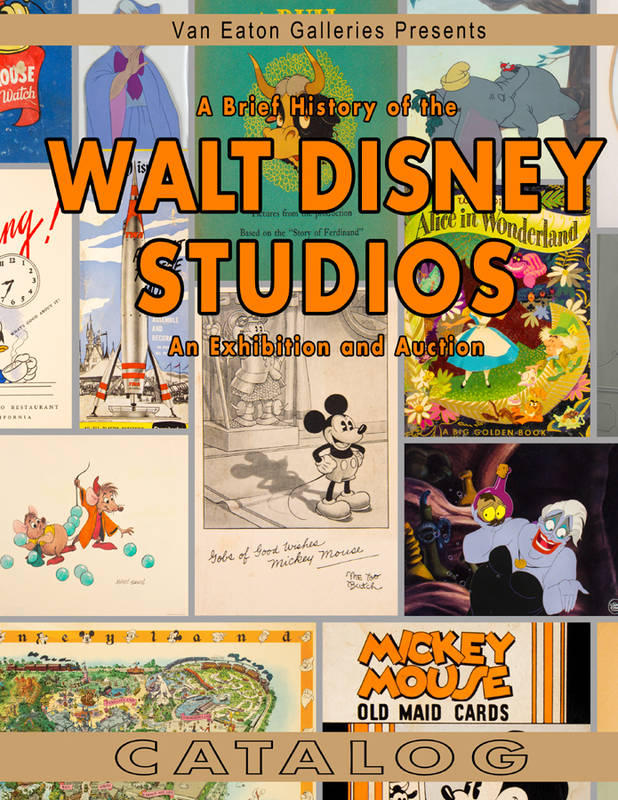 This one-of-a-kind auction examines the events and individuals that helped build the Walt Disney Studios and theme parks into what we know them as today. This auction contains remarkable artifacts from Walt’s early life, such as a stock certificate for Walt’s animation company “Laugh-O-Gram” Studios, as well as Walt Disney’s personal business card from his time working on the Oswald cartoons. This auction also contains such items as animators’ desks and furniture from the Walt Disney Studios, rare animation artwork from the 1920s up through the Disney Renaissance, original Disneyland props and artifacts, as well as the original brownline that Walt Disney first drew the boundary of Disneyland on. This remarkable auction contains nearly 600 items, and represents almost 100 years of creativity and imagination from the mind of Walt Disney and the employees of the Walt Disney Studios.